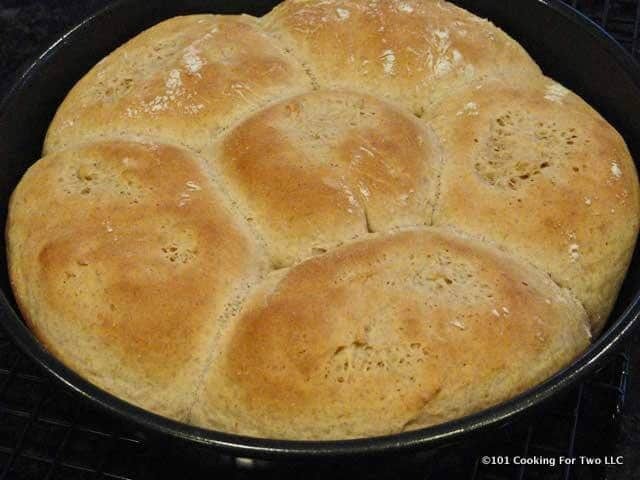 Wonderful home-made quick and easy honey whole wheat dinner rolls for dinner tonight in 80 minutes while you let the stand mixer do all the work. Editor’s Note: Originally Published February 8, 2011. Last Updated July 13, 2018, with re-edited text and photos. What good is that KitchenAid stand mixer that sits on your counter? Yes, it impresses your friends and family but really when was the last time you cracked it open and fired it up. Well, do it tonight and make this healthy dinner rolls. 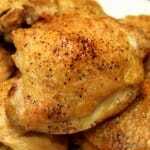 I simplified other recipes and made it single rise for less fuss and more speed. So fire that thing up, and in 80 minutes you can be eating wonderful homemade honey wheat dinner rolls. Yep, really that good. 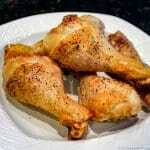 Moist with great taste and tender. Not that dry whole wheat taste. I originally did a 3:1 ratio of white to wheat flour which worked great. 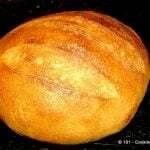 1:1 ratio also works well, but if you go to 100% whole wheat, you may need a few teaspoons more of water and they will not rise quit as much. You could vary this recipe in many ways. Do all white, add some onion flakes, top with sesame seeds. Maybe a cinnamon roll variation? 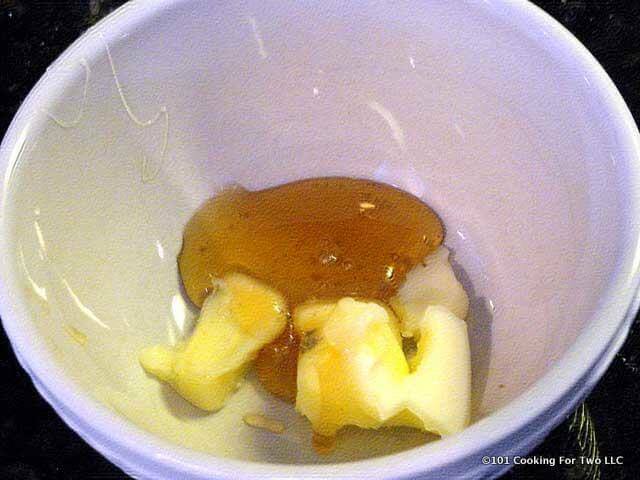 Place butter and honey in small bowl and microwave for 20 seconds to melt butter. 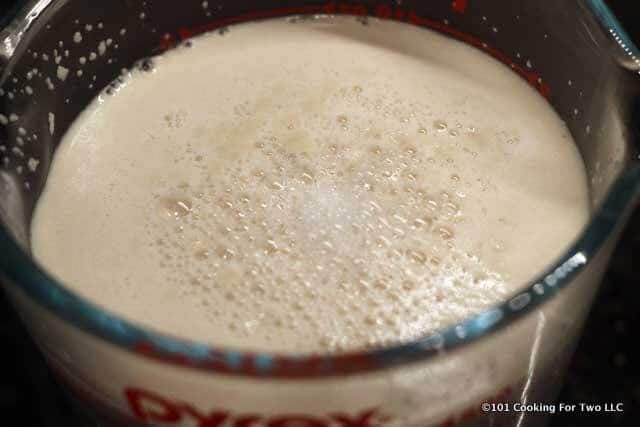 Measure 2/3 cup of warm water (about 105) and add the yeast. Add flours and salt to stand mixer bowl and mix. 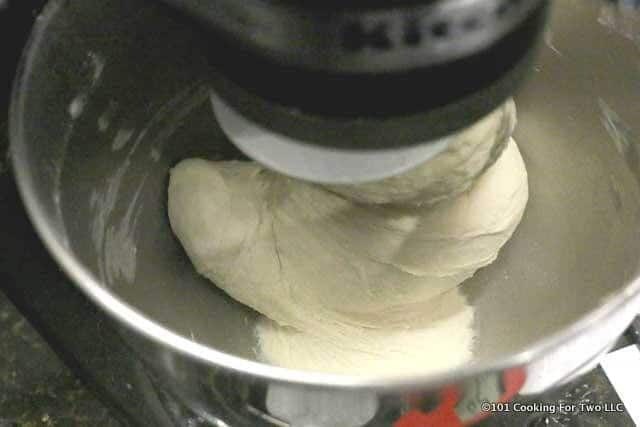 After yeast mixture starts to foam (about 5 minutes) add all ingredients to stand mixer. Mix on 2 with the dough hook for about 8 minutes. After 2 minutes stop and scrape down sides if all dry is not mixed in. The dough should be very wet and sticky. You may need a few teaspoons of water. 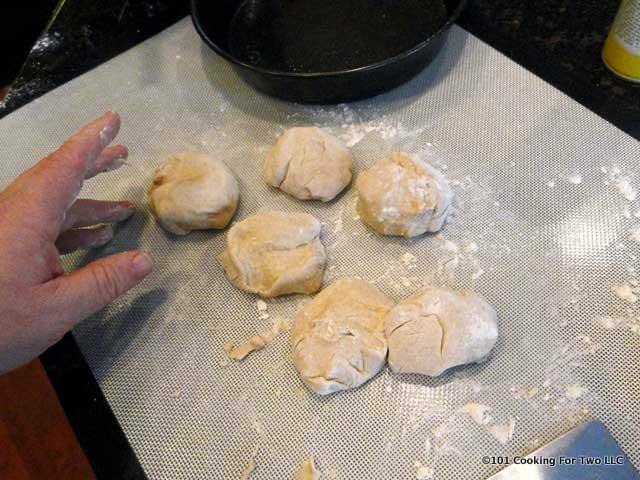 Turn dough onto floured surface and roll into a 2-inch diameter roll. Cut into six even pieces and roll into balls. Lightly dust with flour. Place into 9-inch cake pan sprayed with PAM. Cover with plastic wrap. Pre-heat oven to 375. Place in the slightly heated over or another warm spot to rise. 30 to 40 minutes. Bake until golden brown. 16 to 18 minutes. Add flours and salt to stand mixer bowl mix. After yeast mixture starts to foam (about 5 minutes) add all ingredients to stand mixer. Mix on 2 with the dough hook for about 8 minutes. After 2 minutes stop and scrape down sides if all dry is not mixed in. The dough should be sticky and wet. You may need a few teaspoons of water if the dough is dry. 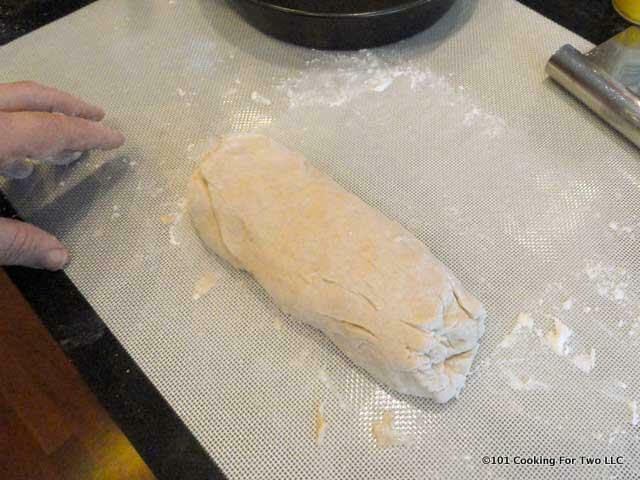 Turn dough onto floured surface and roll into a 2-inch diameter roll. Cut into six even pieces and roll into balls. Lightly dust with flour. Place into 9-inch cake pan sprayed with PAM. 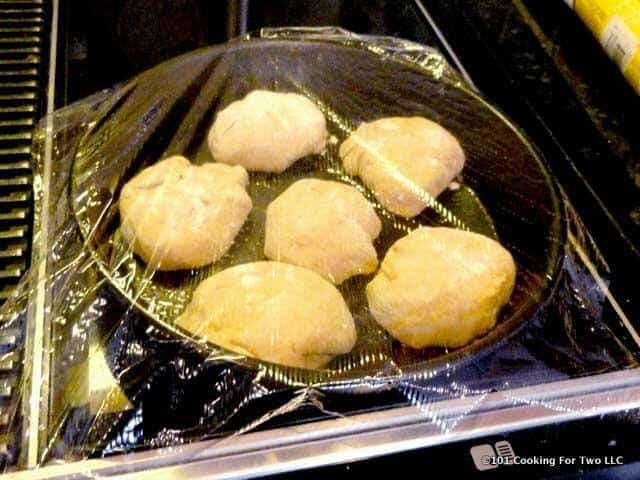 Cover with plastic wrap and place in a warm spot to rise. 30 to 40 minutes. Cold weather option: turn on over to lowest temp and heat until that temp is reached the turn-off oven. Double for 12 rolls and use a 9 by 12 inch cake pan. You can change the ratio of white to whole wheat flour. You many need a bit more liquid. What if you don’t have a stand mixer, can you use a cusinart or mix by hand? A hand mixer just won’t do it. You can mix it and hand knead it for about 10 minutes. 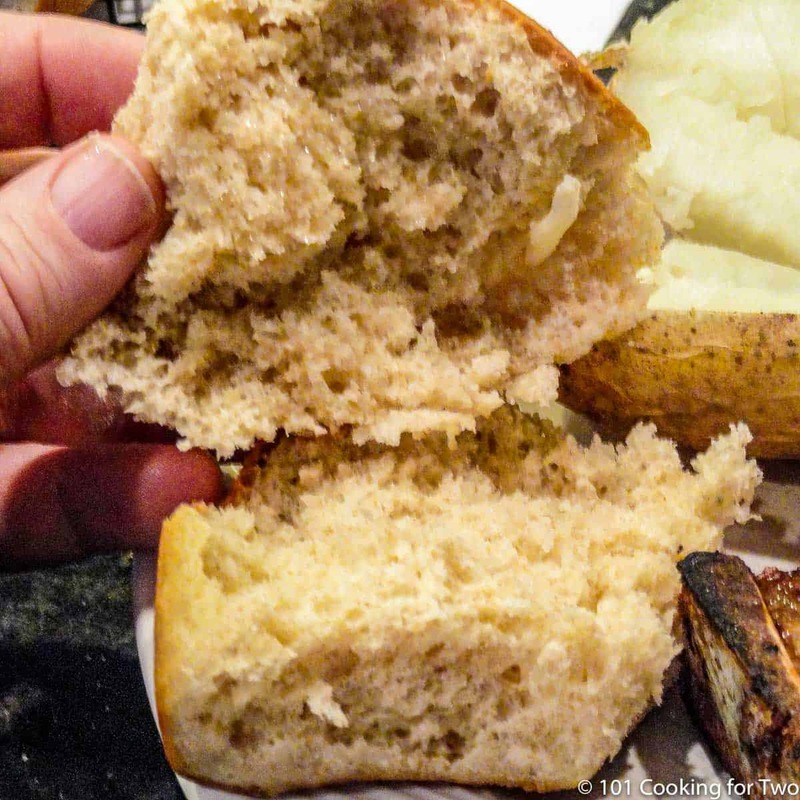 You can try it but like a lot of bread, some gluten is almost required for texture. 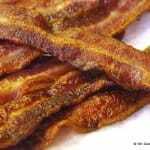 Gluten free cooking is a specialty and is much more than just using a gluten free flour. This is the best thing to happen in my kitchen since I retired and we became a two person family again! I may try semi-baking and then freezing half of these since my resident diabetic has a problem with just one! Thanks for the note. These are very nice, I just forget about them sometimes. I need to move them up on my list. Thanks, they are one of my favorites. I like the one pan thing also since they easy enough to make it worth doing just one pan. These rolls were delicious! I, too, swapped the ratio of whole wheat to regular flour. 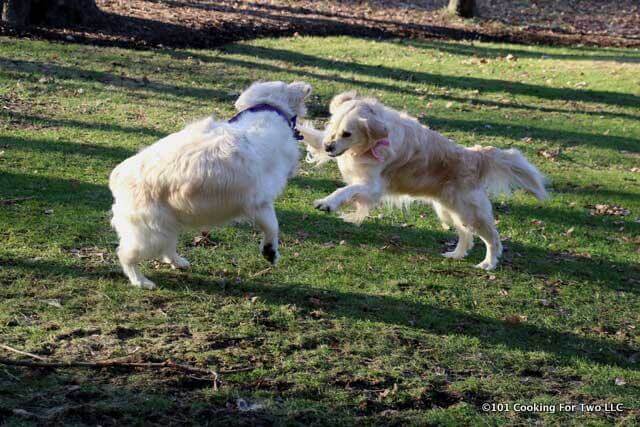 They were still light and fluffy, as the lady above said. Next time, I might try coconut oil instead of butter. 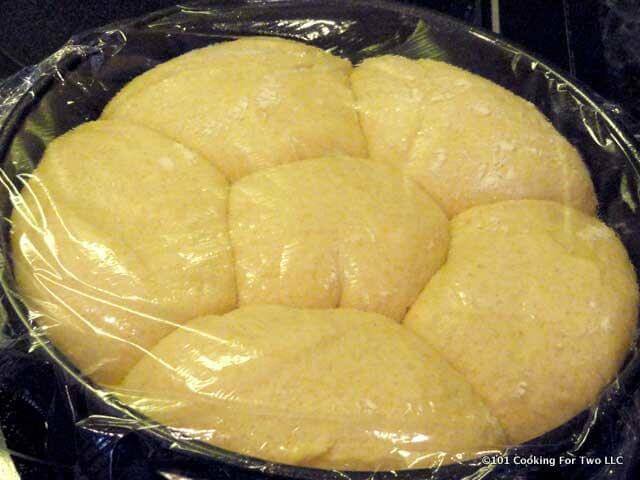 I love that this recipe makes just one pan of rolls. Have at it… I always say it is fine as long as you use your pictures and words in the instructions. They are absolutely delicious! I’m going to post the translated (German) recipe in my blog (linked of course!) if that is ok for you? I made them 3 times already and they get better with every batch. <3 Thank you so much or this wonderful recipe. What a great recipe! I just made these, switching the flour ratios, used an egg white (thanks polarpegs! ), and subbed coconut butter for reg butter. They’re great! light and fluffy, and nice and quick! Thanks so much! Just have to come back and comment one more time. I have made these buns about 4 times since I found the recipe, using the alterations I mentioned above. The last 2 times I drizzled some honey on top, right before popping them into the oven, just to sweeten it up a bit for the kids. They loved them. Today I made them with about an hour and a half to spare before supper. I can’t imagine anything yummier to have with supper than fresh buns hot out of the oven. Thanks again for this recipe. I have been enjoying the fruits of our stand mixer but that is all my wife’s doings. I haven’t used it other than as a meat grinder.